Hotel ibis Frankfurt Offenbach. Book your hotel now! The ibis Styles Frankfurt Offenbach is located in Kaiserlei, right on the border between Offenbach a nd Frankfurt, and just a stone's throw from the new skyscraper of the European Central Bank. Frankfurt and Offenbach are just minutes away by car or S-Bahn. Our hotel has 131 rooms with Sweet Bed by ibis beds. High-speed WIFI is free of charge at the ibis Styles Frankfurt Offenbach hotel. Breakfast Buffet will be served every morning from 06:30 til 10:00 am - on the weekends from 07:00 - 11:00 am. The bar at the ibis Styles Frankfurt Offenbach hotel is always open, so you can take a break whenever you want - whether you fancy a cool beer, a refreshing cider or a tasty snack. Free WIFI is available at the bar 24/7. This is my 3rd stay at this same hotel, at the same time of the year. Everything is the same in terms of clean rooms, very friendly and smiling staff, and a decent breakfast. But this time when booking on the Accor website, we were not informed that one of the 2 elevators was being replaced. Already with 2 elevators the wait was sometimes long during the morning &quot;rush hour&quot;. With one elevator, it was really long. Most hotels will forewarn you of the possible inconvenience when such works are being done. Paid massively more than the hotel is worth as there was a Trade Fair on. Rooms are poorly decorated but normal Ibis Styles size & amenities. There had been no attention to my room request sent 3 months prior to stay even though i'm a Gold member. Boyfriends of reception ladies were in the lobby drinking and keeping the ladies from their work. They advertised with all kinds of nice food at the restaurant but when there their was only pizzas from freezer. We had neighbours that smoked in the hotel room and the management did nothing about it. The hotel has a childish style. It was as expected a pleasant stay. Loved the new additions to the morning Breakfast. In spite of silver status, no welcome drink as usual on other Ibis of this category. And the central air conditioning was clearly unable to cope with the hot weather, resulting in a less than enjoyable experience given the high temperatures. Breakfast was very good though, with fresh pancakes, varied fruit options and the usual offer of pastries. It was satisfying like always. I always book this particular hotel because the staff are all so helpful. Nice stay in rooms with air conditioning, in rooms without it is not that nice in the summer as the noisy area around the hotel will not allow you to leave the window open. The beds are really hard compared with other hotels and i'm missing a big pillow for the bag while sitting on the bed watching TV. TV Sound is hardly disturbed by the desing cover around it. To clear understand the conversations I had to turn the volume louder that I usually would. WiFi was working very well. Comfortable, clean and good free breakfast, but NO sound insulation between rooms! This Ibis Styles hotel perfectly offers what it states: small but comfortable and clear rooms, with a good free breakfast, and friendly staff. Overall a very nice hotel at a decent price. There is one main issue that might make me change hotels for the next Frankfurt fair: there is virtually no sound insulation between the connectable rooms (I was in room 413). My neighbors had their TV on very low, and were speaking in a low voice, and I could hear every sound quite clearly. And at night, the guy snoring was like he was snoring in my room!!! I have never experienced this in any other hotel, and I travel a lot. This is certainly a design/technical problem in the doors. I think there was also sound coming from other rooms through the ventilation and/or bathroom extractor. And I will also repeat my comment from last year: Something must be done to link the two elevators. It is unbelievable in 2018 to see the 2 elevators operating independently, where one must call both elevators, and end up wasting people's time, as well as energy and frustration. A basic modern controller should do the trick. Simply said, if I cannot guarantee a non-connectable room that guarantees quietness, I will not stay in this hotel again. But if you fix the problem, I would be glad to stay here every year for the fair. It is a problem as I have been staying in the Accor group hotels for many many years. Since the new beds have been rolled out across the group (I have probably stayed in around 12/15 different hotels perhaps more) and not really had a good nights sleep. They are all man made fibres with a mattress topper that feels you are in a hospital or sleeping on an incontinence pad. Also I had put a request for quiet room at back on high floor and was allocated 2nd floor (of 6) next to main front road. Was told hotel was full, it was not and later after arguing managed to move ! Into Offenbach just for one night and unfortunately delayed on the train and arrived at the hotel with an hour to my concert. Boy, was the Ibis a welcome sight! Welcoming staff got me sorted out in double quick time and booked me a taxi. On return from the concert the excellent bar was the first port of call, then bed. Plenty of space in an immaculate bedroom which was spotless, and an wonderful nights' sleep. A perfectly adequate breakfast with lots of stuff to choose from, with plenty of fruit juice and coffee (my most important part of any morning). Then check out and the excellent staff got me another taxi. A real flying visit and I'll be back same time next year, to the same hotel. A thoroughly enjoyable although short stay. This was my 3rd stay in an Ibis, hotel, but my first in a Styles. It won't be my last! I have joined Clubaccor, and all my subsequent hotel stays will be in a Styles or Budget. Spotless room, comfortable bed, and an adequate breakfast. All I need, really! Greeted by friendly, english-speaking staff. Comfortable modern room with clean decor. Excellent breakfast. My only slight disappointment was that although I had chosen hotel as parking was included the car park was too low to accommodate my 1.9m high vehicle. Ibis Styles Offenbach is located in a business quarter outside the centre of Offenbach or Frankfurt. The surroundings are office buildings, and the next restaurant is in 15 minutes walking distance. If you don't mind to be far of all sights, but have a keen eye on your expenses, then Ibis Styles Offenbach is the right place for you. Throughout the year, and during public holidays and weekends in particular, this hotel has very competitive offers. 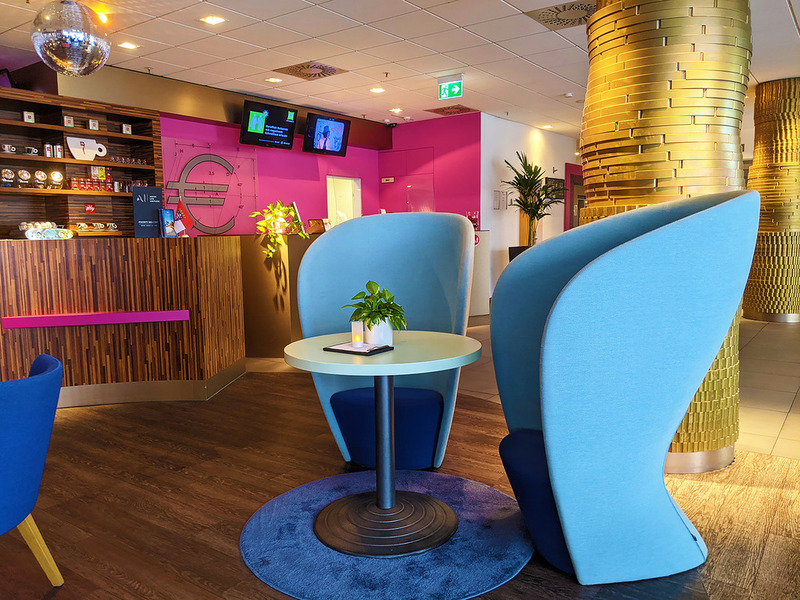 Ibis Styles are more comfortable than the average Ibis hotel, the rooms are large, as are the bathrooms, and a breakfast is included in the price. As I travel by car and just look for a nice place for the night, Ibis Styles Offenbach has repeatedly been my choice.